The first notes on spiders in Bohemia were published by Johann Daniel Preyssler (1768–1839) at the end of the 18th century. More extensive species lists were published in the second half of the 19th century by a museum assistant František Prach (1839–1863), and grammar school teachers Emanuel Bárta (1841–1906) and Antonín Nosek (1865–1916). 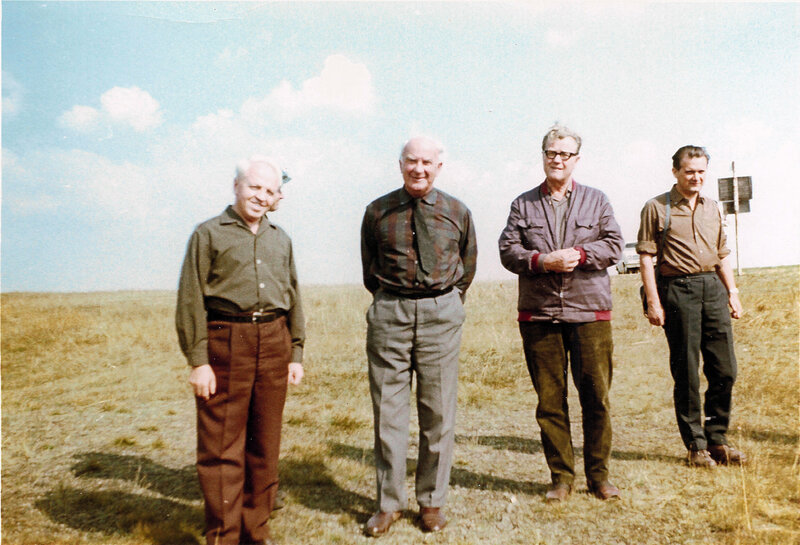 Systematic research on the arachnofauna of the territory of the present Czech Republic started in the 1930s by cooperation between two important Czech arachnologists, František Miller (1902–1983) and Josef Kratochvíl (1909–1992). Kratochvíl focused on research on the spiders in Balkan caves, and Miller on taxonomic research on Czechoslovak arachnofauna. Jiří Baum (1900–1944) and Vladimír Šilhavý (1913–1984) published several arachnological papers during the same period. The most famous Czech arachnologists Josef Kratochvíl, František Miller, Vladimír Šilhavý and Jan Buchar at Mohelno reserve during the 5th International Congress of Arachnology organized in Brno in 1971 (photo P. Bonnet). Miller became the main arachnological researcher in Czechoslovakia. Thanks to his artistic ability, he produced a comprehensive collection of drawings of all our spider species. The study of spiders of serpentine rock steppe near Mohelno represented his first extensive work, richly supported by drawings. A series of revisions of problematic spider genera followed. Professor Miller, working after the Second World War at the Agriculture University in Brno, provided willing assistance to beginners in arachnology. The year 1971 was important in the development of Czechoslovak arachnology. The fifth International Congress of Arachnology was organised in Brno in honour of Prof. F. Miller. 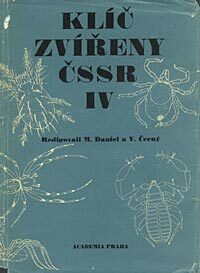 The fourth volume of the Key to the Fauna of Czechoslovakia was published in the same year; it contained the key to pseudoscorpions by Petr Verner, the key to harvestmen by Šilhavý, and Miller’s crucial work, the key to the spiders of Czechoslovakia. 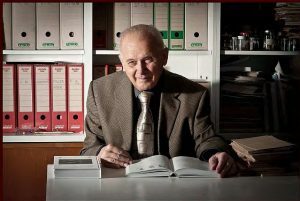 The arachnological centre at the Faculty of Sciences, Charles University in Prague, where the leading worker was Jan Buchar (1932–2015), began to be important in the 1970s. Buchar critically evaluated all data on the occurrence of spiders in the territory of Bohemia. In 1958–1970, he performed a faunistic-ecological investigation of spiders at sixteen model localities, which represented the basic types of habitats in Bohemia. In his thesis, Buchar evaluated the arachnofauna of Bohemia and elaborated a classification of the species’ abundance, thermopreference and dependence on the degree of deterioration of the habitat; all aimed at the use of faunistic data for the monitoring of environmental changes. 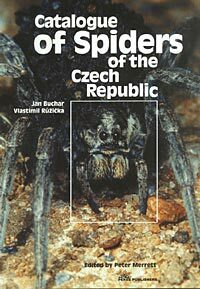 Miller’s book in Czech provided students with a new, reliable identification key to spiders. Buchar based the next development of arachnological research on this fact. He acquired new students and started to organize on the one hand regular arachnological excursions, focusing on research in less explored regions, and on the other hand regular arachnological seminars. An arachnological excursion to the surroundings of Turčianské Teplice in Slovakia was organised in 1974. This excursion became a constituent assembly of the Arachnological Section of the Slovak Entomological Society. Jaroslav Svatoň became its first president, and Miller was president from 1978. The founding of the Arachnological Section was very important for stimulating the study of spiders in Slovakia and encouraging cooperation between Slovak and Czech arachnologists. Buchar became a president of the Arachnological Section in 1983. Ten years later, in 1993, Czechoslovakia was divided into two independent states, the Czech and Slovak Republics. Consequently, the independent Czech Entomological Society was established, and under its auspices, the Arachnological Section was established, with J. Buchar as a president, and Vlastimil Růžička as a vicepresident. V. Růžička organised the 15th European Colloquium of Arachnology in České Budějovice in 1994, he published the arachnological newsletter Pavouk from 1995 (to 2010), arranged the bibliography of spiders and created the faunistic database. Under the leadership of Prof. Buchar, about forty arachnological excursions have been organised between 1972 and the end of the millennium; their results have contributed importantly to our knowledge of the arachnofauna of the Czech and Slovak Republics. Eighty two arachnological seminars have been organised in the same time span. Numerous Czech arachnologists were pupils of Prof. Buchar, or their professional interests were developed under his leadership. We can consider the Czech arachnology as Buchar’s arachnological school. 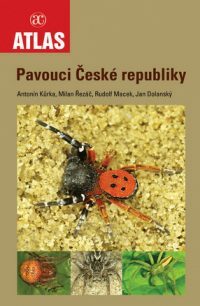 The Catalogue of Spiders of the Czech Republic, containing data on 830 spider species known up to 2000, was published in 2002 by Buchar and Růžička. The independent Czech Arachnological Society was established in 2008. V. Růžička (2008–2010), Stanislav Pekár (2010–2015) and Milan Řezáč (from 2015) served as presidents of the society. The Czech Arachnological Society includes both professional and amateurs arachnologists. It has over 100 members. The main aims is to join people interested in arachnids and to provide them service and facilities: actualizing check-list and databases, sharing contacts, organising seminars, meetings and field excursions and publishing a newsletter. Members of the Czech Arachnological Society reach to excellent results in several fields that are being published in prestigious scientific journals and presented on arachnological congresses. For these reasons, we were asked to organize the arachnological congress for the third time. In 2015, the 29th European Congress of Arachnology was held in Brno under the leadership of S. Pekár. First species lists of spiders were published by Prach, Bárta and Nosek, see above. Nosek cooperated with W. Kulczyński, and his survey includes a list of species collected by spa doctor A. A. Palliardi and determined by L. Koch. The material collected by E. Nielsen was determined by E. Schenkel. Buchar determined the collections of a grammar school teacher J. Martínek. Buchar was also involved in the publication of the Czechoslovak grid map by the Zoological Society and focused the work of the arachnological centre on this method of evaluating species distribution. Systematic research on the arachnofauna of the Czech Republic continues up to the present time. Rate of discovery of spider species in the Czech Republic. The principal contributors with their main period of activity are indicated. Faunistics of harvestmen was performed by V. Šilhavý and Leoš Klimeš in the past. Currently it is a domain of Pavel Bezděčka and Antonín Roušar. Research on pseudoscorpions was conducted mainly by P. Verner and Václav Ducháč (1952–2004), in present František Šťáhlavský is active in this group. Miller was a leading figure of the taxonomic and faunistic research on spiders in Czechia for several decades. His main focus was central European spider fauna, he published revisions of many taxonomically difficult groups (e.g. the genera Porrhomma, Panamomops and Centromerus). Kratochvíl was an universal zoologist. In arachnology he focused on cave fauna of the Balkan Peninsula (coauthor of the harvestman family Travuniidae, revisions of spiders of the families Leptonetidae, Dysderidae and Nesticidae, genera Stygopholcus, Histopona and Tegenaria). Buchar published a series of papers about taxonomy of wolf spiders, numerous of them with Konrad Thaler from Innsbruck. Pekár publishes revisions of Zodariidae spiders, Řezáč revised the genera Eresus and Dysdera in central Europe. Lenka Kubcová described a new Philodromus species from Czechia, Věra Opatová studied Dysdera spiders in Sardinia, and Růžička is interested in the genus Porrhomma. Jan Dolanský studies the genus Cheiracanthium. Růžička with collaborators completed a survey of spider species described by Czech authors and the type material deposited in our collections. The most significant Czech opilionologist was a medicine doctor and painter V. Šilhavý. 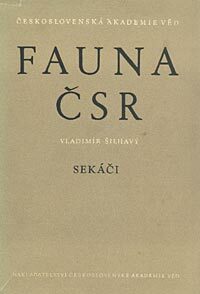 He published a monograph on central European harvestmen as one of the volumes of the Fauna of Czechoslovakia. František Kovařík published many extensive papers (including monographs) about scorpions. Jaromír Hajer has focused on the study of morphology, anatomy and function of the spinning apparatus of spiders. He described the development of the spinning apparatus of various species during their whole ontogeny. He described also web and egg sac construction and behaviour of several species (e.g. Trogloneta granulum). Petr Dolejš studied histology of silk glands in wolf spiders. Beside spinning systems, Pekár studied a gland called femoral organ in the genus Zodarion, and Tomáš Krejčí described the female genitalia of Eresus. 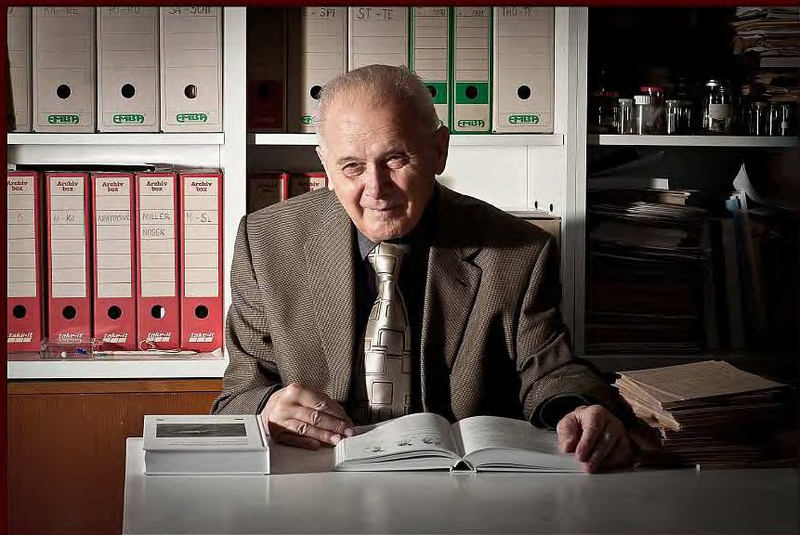 Karyological research on arachnids represented by Jiří Král, F. Šťáhlavský and their students belongs to the most significant Czech contributions to the global arachnology. These teams use karyological markers to understand cryptic diversity and interspecific relationships. Moreover, Král contributes to the knowledge about phylogenetic relationships among families and even orders. Šťáhlavský’s lab is specialised on pseudoscorpions, scorpions and harvestmen, Král’s lab covers the rest. Ethological research on arachnids started relatively late in Czechia. In 1956, B. Novák published a paper about the behaviour of Argyroneta aquatica. In last decades ethological research became popular among Czech arachnologists. The most significant is the research of ant specialised spiders performed by Pekár and his students. Noteworthy is also the research of Řezáč, who found traumatic insemination in spiders and described several capturing tactics specialised on hunting woodlice in the family Dysderidae. Dolejš studies behaviour of wolf spiders. 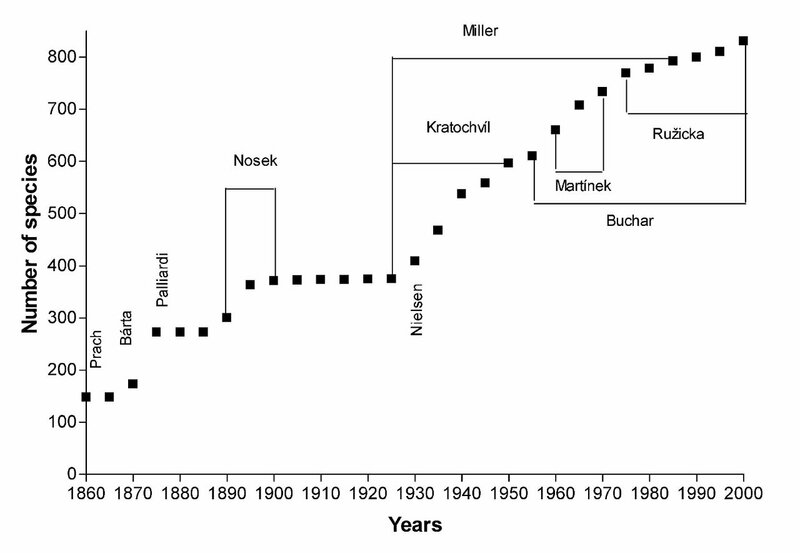 As well as ethology, ecological research became more frequent among Czech arachnologists relatively recently. Antonín Kůrka concentrates on research on the spider communities of peat bogs. Růžička performs a complex research on arachnids of the subterranean habitats, especially research on the microclimatically extreme habitats of talus slopes. The surveys of postindustrial sites point out the importance of these habitats for some endangered species. Zdeněk Majkus performed an extensive study of spider communities on spoil heaps after black coal mining, Robert Tropek is interested in spider communities in limestone quarries and fly ash deposits. The lab of S. Pekár focus mainly on nutritional ecology of diet specialised spiders. In the lab of Vladimír Hula, Jana Niedobová is interested in the influence of pesticides on spider populations, and Ondřej Košulič studies the interactions between the landscape structure and structure of spider communities. Jan Erhart and Stanislav Korenko study interactions between spiders and their parasitoids. Kratochvíl described the expansion and retreat of Lycosa singoriensis in Moravia in articles from 1932 and 1951. Řezáč studied the distribution of purse-web Atypus spiders in central Europe in connections with degree of continentality and soil properties. Růžička is interested in central European habitats inhabited by spiders with disjunctive distributions, mainly in talus slopes. Because of rich presence of carboniferous sediments, Czechia became an important territory for the research of Palaeozoic arachnids. 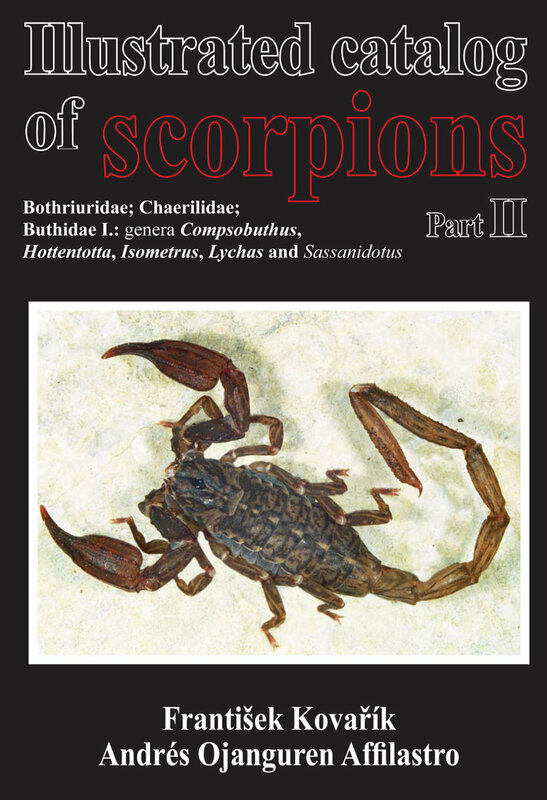 Many spiders, trigonotarbids and scorpions, two phalangiotarbids and even one uropygid were described by A. Frič., A. C. J. Corda, J. Kušta, and more recently by A. Přibil, S. Opluštil and Ivana Hradská. One of local trigonotarbids, Anthracomartus bohemica (Frič, 1899) from Nýřany in western Czechia, is in the logo of the Czech Arachnological Society. The first book popularising spiders was published by the zoologist and writer J. Baum. He travelled all over the World and published several travelogs but during German occupation, he came back to Czechia and was very active in resistance against Nazism. The career of this enthusiastic zoologist ended in the concentration camp in Poland. His book was later upgraded by Buchar. Buchar, together with Kůrka, is also the author of another book about spiders, Naši pavouci. Rudolf Macek, J. Erhart and Radek Šich are interested in photographing spiders. In 2015, Kůrka, Řezáč, Macek and Dolanský published a comprehensive atlas of the Czech spiders named Pavouci České republiky.